Karl Amadeus Hartmann's opera Simplicius Simplicissimus has a strong reputation, being the operatic response of a composer who famously refused to compromise his principals in the face of the Nazi regime in Germany. 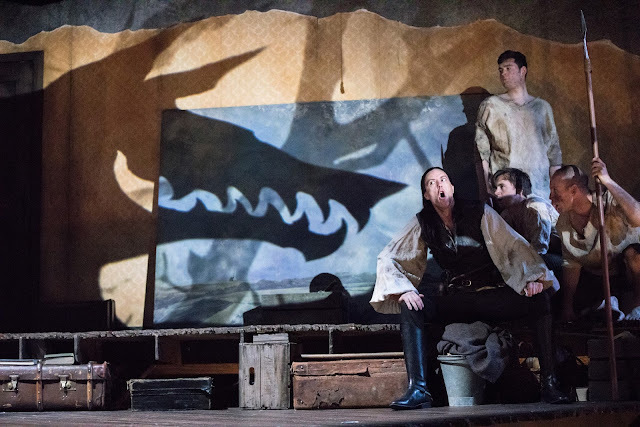 Despite this, the work had never been staged in the UK, so that Independent Opera's performance on 11 November 2016 at the Lilian Baylis Studio, Sadler's Wells, was a real opportunity to experience this strikingly dramatic work. The opera was directed by Polly Graham, with designs by Nate Gibson, lighting by Ceri James, projection designs by Will Duke and choreography by Michael Spenceley. Timothy Redmond conducted the Britten Sinfonia, with Stephanie Corley as Simplicius, Emyr Wyn Jones as the Farmer, William Dazeley as the Soldier, Adrian Thompson as the Hermit, Tristan Hambleton as the Sergeant, Mark Le Brocq as the Governor, Matthew Durkan as the Captain and Chiara Vinci as the Woman. The work was sung in David Pountney's new English translation. Hartmann was born in 1905 in Munich and initially wrote in a neo-classical style with jazz influences, but the coming of the Nazis wrought extreme changes on his style. Personally he went into what he termed internal exile, withdrawing from public life, and his music became more serious. Hartmann's opera Simplicius Simplicissimus dates originally from between 1934 and 1936. Based on Hans Jakob Christoffel von Grimmelshausen's 17th century novel about the 30 Years War, the opera was designed to explicitly satirise the Nazis. Mixing music with spoken dialogue, stylised, rather theatrical and not a little didactic, the work seems to have been in the same genre as some of Bertolt Brecht's Lehrstücke some of which had music written for them (Der Jasager of 1930 had music by Kurt Weill, Der Ozeanflug of 1927 had music by Weill and Hindemith). Hartmann wrote his own libretto, with contributions from his teacher Hermann Scherchen. The work was for chamber orchestra, and wasn't actually premiered until 1948. In the 1950's Hartmann revised the piece, removing the direct reference to the Nazis and making it more general, and Hartmann also re-orchestrated it for full orchestra. This revision substantially increased the work's solidity, with a new overture inspired by Prokofiev and other orchestral interludes. Hartmann removed some of the spoken dialogue, setting some of it to music. The version used by Independent Opera was Hartmann's revised version, with a few passages restored. Nate Gibson's spectacular set was a multilevel structure which included the Britten Sinfonia on the lowest level, and at the top had a rubbish strewn attic room which was the space inhabited by the young boy, Simplicius (Stephanie Corley). During the long overture we saw Simplicius playing with his toys, being shouted at by parents and being harassed by the local Hitler youth. The three episodes of the story were thus seen as the boy's response to his surroundings and at various times during the opera, we would see him sitting in the corner, reading (presumably von Grimmelshausen's novel) and writing. During the opera this set would be overlayed with projections (designed by Will Duke) which wrought simply magical transformations, I particularly enjoyed the way that Duke's projections transformed a large landscape painting into a variety of different moods. The revised version of the opera's extensive use of the orchestra means that for an opera lasting 90 minutes there is in fact remarkably little singing. Polly Graham's solution was to create highly physical theatre so that the ensemble were almost constantly active, providing added narrative commentary or more metaphysical comment on the action. This, combined with the multi-level stage set made for very thrilling theatre which matched the vividness of Hartmann's wonderful orchestral writing, which was brought out by Timothy Redmond and the Britten Sinfonia, including a positive batterie de cuisine of percussion. Graham's approach eschewed any element of Brechtian distance or irony, there was no sense of Lehrstück. The disturbing events of the last scene, including the sexual abuse of the Woman (Chiara Vinci) by the Governor's (Mark Le Brocq) entourage, were depicted graphically. Given that Hartmann's music does a lot of the work, I think that a more stylised approach would have worked better. The result was to make the ending of the work shockingly disturbing rather than thought provoking. That said, Graham drew from her cast a superb ensemble performance with no-one putting a foot wrong (both physically and metaphorically). This was thrilling theatre, and a striking response to the music. 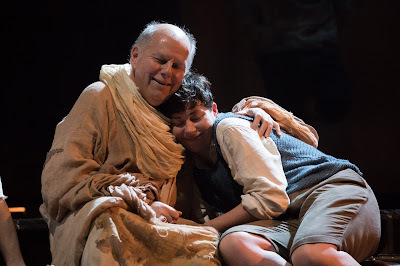 Stephanie Corley made an appealing, and fearless, Simplicius, entering into the physicality of the production whilst singing with a lovely bright flexibility which made her sound suitably boyish. She also brought a charming directness to the boy's simple-ness. William Dazeley made the Soldier nicely devil-may-care but with enough depth to allow us a degree of sympathy, and he sang finely too. Adrian Thompson made a charming hermit, carefully avoiding any sense of prosy sententiousness. 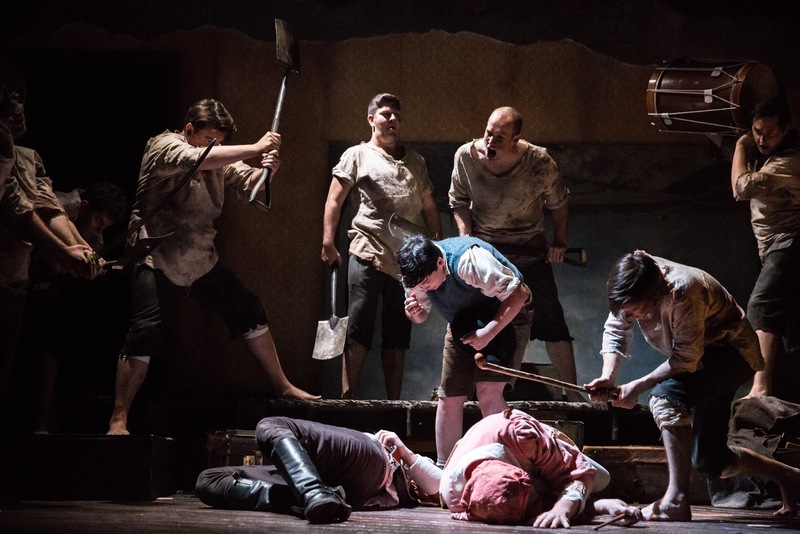 Mark Le Brocq was simply brilliant as the Governor, wearing an alarmingly pink dress-like tunic, and there was able support from Tristan Hambleton as the Sergeant, Matthew Durkan as the Captain and Emyr Wyn Jones as the Farmer. A special mention must go to Chiara Vinci for her intense performance, the only female character yet a non-singing one. Under Timothy Redmond the Britten Sinfonia really relished Hartmann's music and it was the composer's experience as a symphonist which really came out so that the orchestral writing took on a vivid life of its own. A note on the name, Simplicius Simplicissimus, this was pronounced by the cast using the standard English/Italianate pronunciation of Latin with 'ci' rendered as 'ch' but all my German friends, particularly the Bavarians, use Germanic Latin pronunciation and would render 'ci' as 'ts', surely that is how Hartmann would have pronounced it. This was a performance which brought Hartmann's thought-provoking work to life and the entire cast must be credited with their stunning theatrical response to director Polly Graham's vision.